Dior Prestige La Crème Texture Essential Refill, 1.7 oz. DiorPrestige La Crème Texture Essential Refill, 1.7 oz. An exceptional performance measured by an independent dermatologist*. Through 7 marriages, a brilliant horticulturist tamed its wild nature and enhanced its regenerative potential. He gave rise to the Rose de Granville, the first rose specifically created for skincare. Culmination of 15 years of research, Dior Science isolates for the first time ever the secret of its unprecedented life force: 8 molecules that no other rose possesses. A cutting-edge extraction process called dynamic enfleurage concentrates this molecular power into Dior Prestige skincare. 24K Gold Gel Primer - Firm, 2.0 oz. Dior introduces luxury skin care's first refill system. 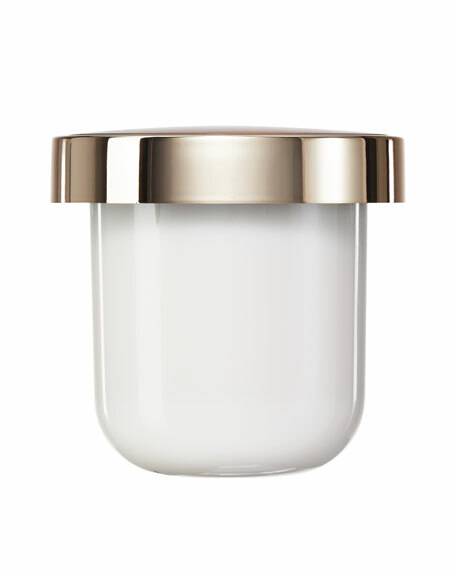 Designed as an elegant, convenient and conscientious solution for replenishing your L'Or de Vie skin care, each golden vessel twists easily out of its glass base as soon as it is empty, ready to be replaced by a fresh refill.